Around 1058 students were awarded degrees and diploma’s at the 15th convocation of Tezpur University. The Chief Guest of the ceremony was Anil Kakodkar, former Director of BARC, former Chairman, Atomic Energy Commission and Secretary to the Government of India, Department of Atomic Energy. Referring to the Global Trends 2030: Alternative Worlds, a recent report of United States, he mentioned that the period between the year 2015-50 is identified as demographic window of opportunity for India. To this end, the universities have responsibilities towards leading the society in right path. Kakodkar urged the graduates to play the desired role in leading the society. Among 1058 degree and diploma recipients, 64 were Ph.D degrees, 679 Masters, 248 B.Tech/B.Sc/BAs, 45 PG Diplomas, and 22 were degree and diploma under the open and distance learning programmes. Chancellor of the university and Assam Governor Jagdish Mukhi, presided over the convocation ceremony. While conferring the degrees to students he observed that students of the university are regularly getting placed in reputed organizations of the country and abroad. 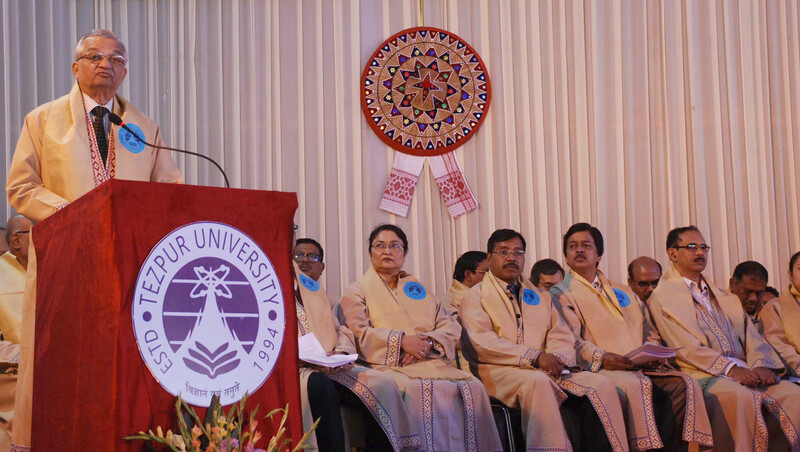 He also mentioned that Tezpur University is a product of Assam Accord which aspires to generate knowledge and manpower for the nation building process, and the university has been successfully trying to deliver the mandate. Professor Madan M Sarma, the Vice Chancellor (Acting) of the university, highlighted the achievements that the university has earned through research and other outreach activities. Also, in attendance were Professor Dhruba Jyoti Saikia, former Vice Chancellor of Cotton University (then CCSU), Gita Upadhyay, Sahitya Academy Awardee among others at the ceremony.